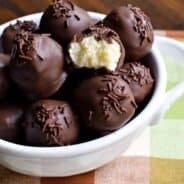 Looking for a beautiful spring dessert idea? 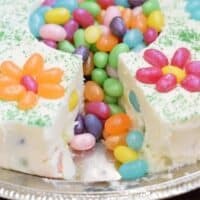 This Jelly Bean Fudge is packed with flavor and fun! Do any of you sit around, watch tv, and think about food? It’s normal right? It’s also normal to hide “said food” from family members. Am I still right? I grew up with three brothers, so hiding food is how I managed to enjoy my favorites. Mom would come home from the grocery store and I never complained about helping her unload. To me, this was my opportunity to scope out the goodies and “hide” my favorite items. You know, my favorite candy, my favorite cereal, etc. My brothers would never know there was a box of fruity sugary cereal in my room because they never saw it in the first place! If you’ve ever seen 3 boys pour themselves a huge tupperware bowl of cereal, you would understand how a little girl would be left with the crumbs in the bottom of the bag. It was survival of the fittest…or outsmart the boys! Anyway, I’ve noticed that as an adult I still have a tendency to hide food. Not necessarily in my room, but I’ll push those cookies to the back of a cabinet and behind the jars of olives and green beans where my kids are sure to not take a second glance. Or I’ll buy my favorite candy and hide it in cabinet with the pots and pans. And then, while sitting and watching my favorite tv shows, I think about food. And where in the world did I put it and hide it!?! Unless of course I’m creating a fun treat. One for kids AND adults. How great is this easy, Jelly Bean Fudge ring? Wouldn’t it be gorgeous on your Easter dessert table? Or for Mother’s Day? Wrap it in cellophane and it would make a wonderful gift for new mom, or a teacher, or a friend’s birthday! As I stared at the packages of Jelly Belly® jelly beans, the cute pastel flowers spoke to me! 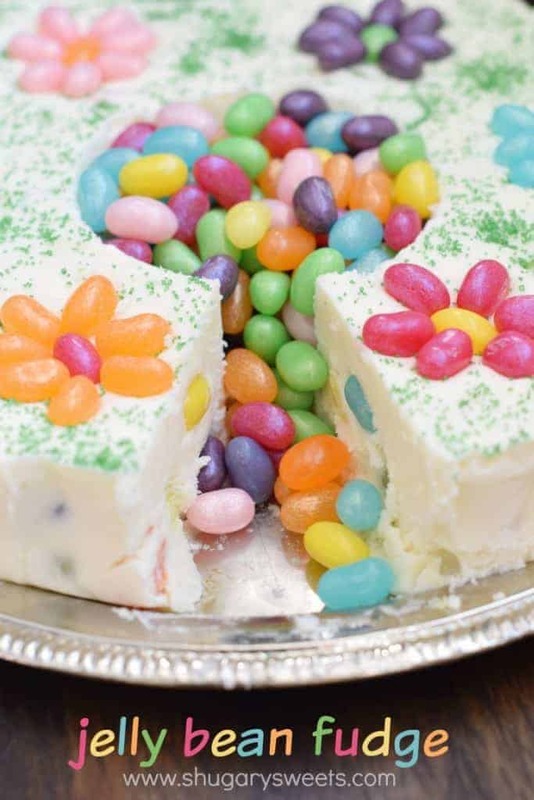 I knew I had to decorate this special fudge with some adorable jelly bean flowers. Making this fudge is super easy too. I used my 9 inch springform pan and wrapped it in foil. I then took an empty can (it was those green beans from my pantry in case you were wondering) and wrapped that in foil too. Press the foil real firm around the can and the edges of the pan. Set this aside while you make the fudge. For the fudge, there is no candy thermometer needed. Just follow the recipe below. Slowly stir in your Jelly Belly® jelly beans (I used the Spring Mix for inside the fudge) and pour your hot fudge mixture into your prepared pan. Sprinkle with your green sanding sugar. 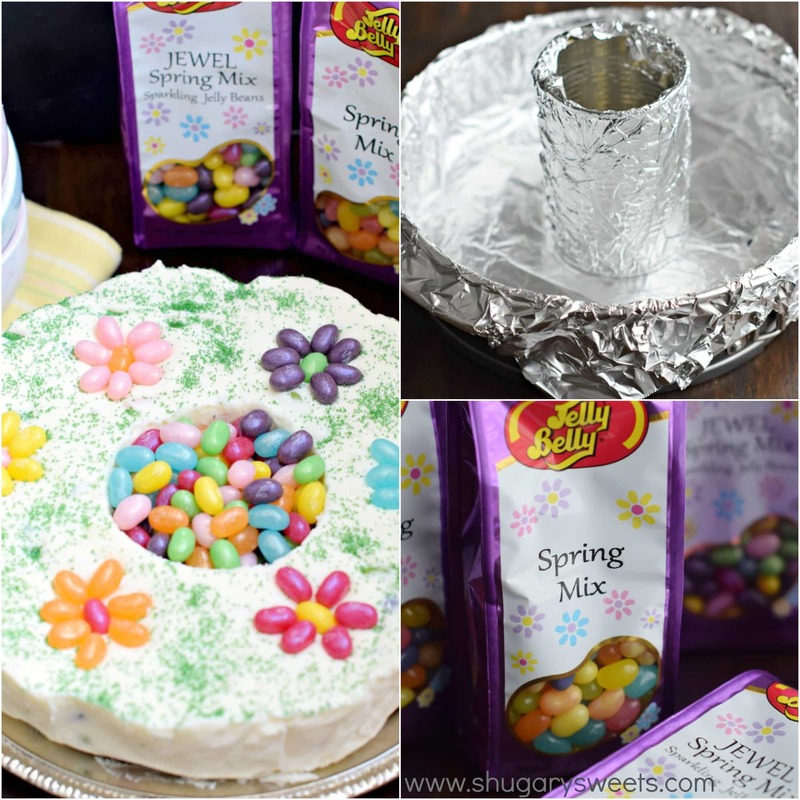 Then, use the JEWEL Spring Mix of the Jelly Belly® jelly beans to create fun flowers for the top of the fudge. Press them in gently on the top of the fudge. When you’re all finished decorating, refrigerate the fudge, uncovered, for at least 4 hours (or more)! When you’re ready to place on a plate, unclasp the springform pan to release the fudge. Peel away the foil, gently. For the center can you may need to use a small butter knife and wiggle the can out carefully. Place your fudge ring on a serving plate and fill the center with extra Jelly Belly® jelly beans. Leave a small knife near the plate, so your friends and family can serve themselves. ENJOY!! 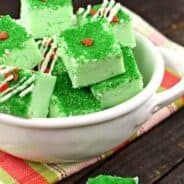 Fun and festive Jelly Bean Fudge recipe! Prepare a 9inch springform pan by lining it with foil. Wrap foil around an empty fruit or vegetable can. Place in center of springform pan and set aside. In a large mixing bowl, add the marshmallow cream and white chocolate morsels. Set aside. In a large saucepan, add sugar, heavy cream, unsalted butter and salt. Bring to a boil over medium high heat, stirring frequently. Once boiling, continue to boil for a full 4 minutes, stirring constantly. Remove from heat and pour over marshmallow mixture. Using an electric mixer, blend for about one minutes, until morsels are melted and mixture is smooth. Fold in the 1 1/2 cup Jelly Belly® jelly beans, until combined. Pour into prepared pan. Sprinkle with green sanding sugar. 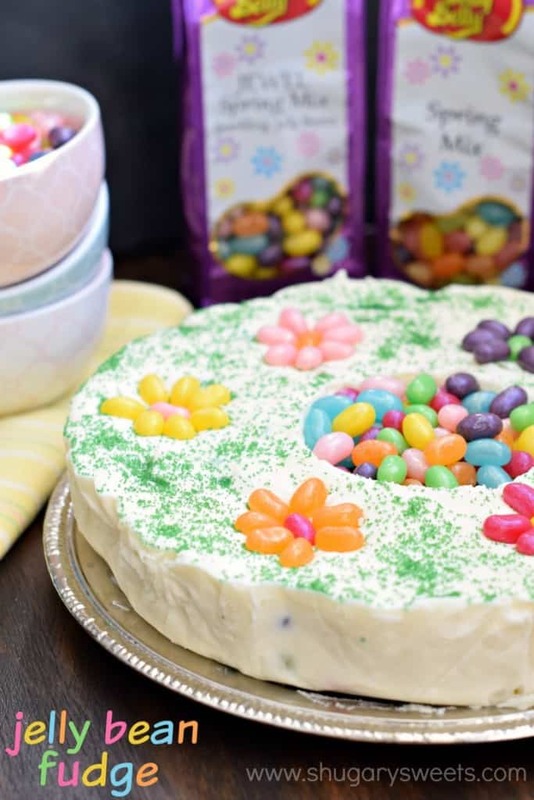 Using the JEWEL spring mix of Jelly Belly® jelly beans, arrange into flowers on top of fudge. Once decorated, place fudge, uncovered, into the refrigerator for 4 hours, or overnight. When ready to serve, remove fudge from springform pan by releasing the latch. Unwrap the foil and place on a serving plate. You may need to use a butter knife to gently cut and remove the center can, wiggling it out gently. Fill center of ring with remaining Jelly Belly jelly beans. Serve with a knife so guests can cut their own pieces! ENJOY. Beautiful spring and Easter fudge, Aimee! Aimee, I am SO with you! My older brothers would take my food, too! So I hid everything, and as a result, I still feel that urge. I have a very clear memory of wrapping up a piece of pumpkin pie and hiding it in the egg bin. This fudge is a dream. My kids would LOVE this. Maybe I’ll be the best mom ever and make it! You are definitely the queen of fudge! This looks amazing, Aimee! The flowers look so cute! This fudge is adorable! Yeah I imagine how you’d have to have some serious moves to keep three brothers from eating all the good stuff! These fudge is so darn cute. Love it! Love how you decorated the fudge! So cute! This fudge is juts too adorable! Pinned! Yup, I had brothers. And yup, I’m a food hider too. Must have something to do with having four boys of my own now. 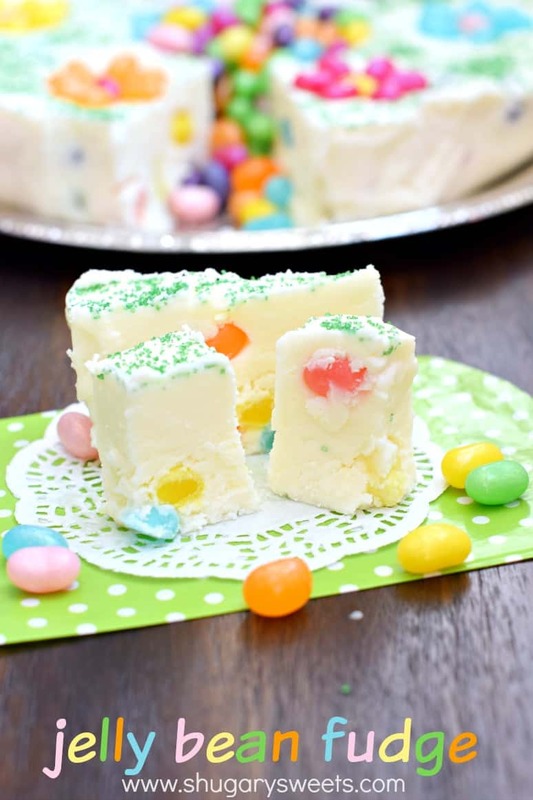 Love this jelly bean fudge, says Easter and spring! That has got to be the prettiest fudge ever!! Those jelly beans are such gorgeous colors — Jelly Belly’s are my absolute favorite!! How beautiful!! My husband is a jelly bean fiend and would love this!! I can see how hiding food from 3 older brothers would be the way to get the things you wanted to eat without them scarfing it first!!! I do love Jelly Belly jellybeans over any other…Dr. Pepper beans rule!!! And this is seriously the cutest fudge!!! I love the cute flowers on top!!! What a fun fudge! So perfect for Easter! Super “sweet” idea! =) So cute! So festive and so fun. It really highlights all the pretty colors of the jelly beans! What a fun recipe, and I absolutely love those gorgeous Jelly Belly mixes! I mean how can you go wrong with jewel tone jelly beans? Love! I love the idea of this in a ring of fudge! And so festive with the Jelly Bellies. I don’t know if my mom knew growing up that I hid food. She probably assumed one of them ate it all, haha. She knows now though, cause we talk about it. And we talk about how my brothers never ate Golden grahams (my favorite cereal) because I would take the box to my room and eat it like a snack, haha. Oh I love jelly beans, this is so so beautiful! And so many pretty colours! This fudge looks so great, Aimee! 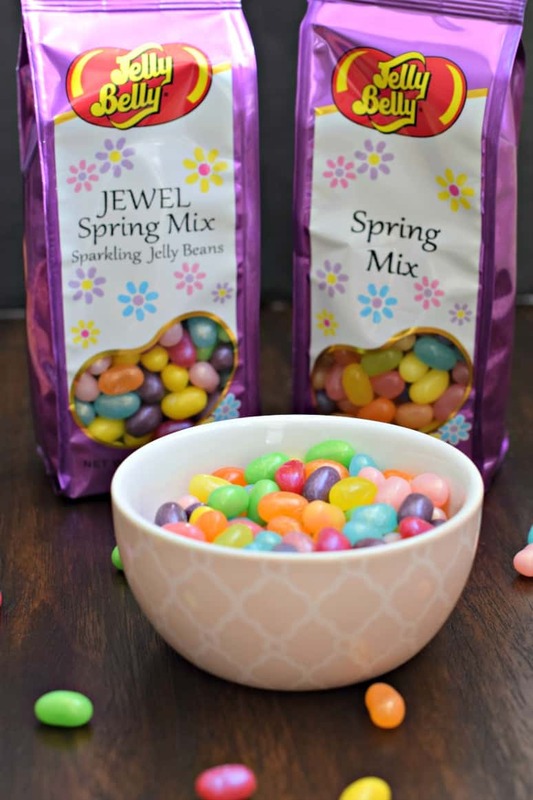 I love Jelly Belly and I know they would make a terrific and fun Easter fudge! This fudge is so pretty! I love the fudge ring! You are so funny about hiding your food! 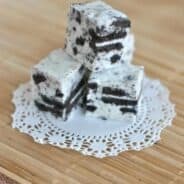 I have a shelf of “blogging food” that is off limits, unless someone HAS to have an Oreo. Luckily I only have one to hide from! What a creative way to use jelly beans. Can I just say, Jelly Belly is the best–nothing comes close. Love this sweet treat. Pinned. Agreed wholeheartedly 🙂 Thanks for pinning Jennie! This fudge is adorable. 🙂 It’s perfect for Easter. I totally hid my halloween candy in my room as a kid! Absolutely FABULOUS Aimee! So darn pretty!! This fudge looks so fun! I love the ring, it’s like a fudge bundt cake! Haha, a fudge bundt cake. I love it!! i love for the jelly beans.it’s really nice.nice posting for the images. Ha – I would totally have to hide the Jelly Bellys!! We were at my inlaws a couple of days ago, and they had a huge Costco sized container of them, and my daughter couldn’t keep her hands out of them. In fact, she said that’s what she wants for her next birthday – a big container of them all for herself!! LOVE this fudge, what a fun idea. I love how pretty this looks! Who new Jelly beans could make something so elegant looking 🙂 I bet its pretty tasty too! This is PRECIOUS! I wish I’d seen this before Easter. My little onions would have loved to make this! And eat it! You don’t get Diabetes from eating a piece of fudge. Just sayin. Jelly beans and cake two of my favorite things.